Name: Quadrigger Stoyn; called himself ‘Janus’ while trapped on Earth during the time of the Roman Empire. Time of Origin: Left Gallifrey at the same time as The Doctor (albeit against his will); spent millennia on an evolving planet outside of Time before being trapped on the moon for over two thousand years in the distant future. Appearances: "The Beginning", "The Dying Light" and "Luna Romana"
Companions: Susan, Jamie McCrimmon, Zoe Heriot, 1st Romana, 2nd Romana and K9. History: While The Doctor had briefly encountered the Celestial Toymaker as a youth ("Divided Loyalties"), and dealt with a rivalry with his Cousin Glospin while growing up ("Lungbarrow"), Quadrigger Stoyn was essentially his first real enemy, as he was the first person to attack The Doctor after the future legend left Gallifrey with Susan. A Time Lord engineer, Stoyn was decommissioning The Doctor's TARDIS when The Doctor and Susan first stole the machine ("The Beginning"). In the ship's engine room when The Doctor set the ship in motion, Stoyn travelled with them to Earth's moon when The Doctor was forced to land the ship there due to a lack of power, Stoyn angry at both being taken from Gallifrey against his will and the burn damage he had sustained to his face when the engines turned on. While The Doctor and Susan were intrigued at the chance to explore a new world, Stoyn was immediately scared at being on a different planet, feeling that the universe outside Gallifrey was too chaotic for him to cope with it when they had only arrived in an artificial jungle created by the race known as the Archaeons, who were attempting to seed Earth with life. However, as The Doctor attempted to talk with the Archaeons, they attempted to strip the TARDIS to examine its technology, its removed temporal engines triggered a stasis field that froze The Doctor, Susan, Stoyn and the Archaeons for several million years. By the time the three Time Lords and the Archaeons were released from the stasis field, several billion years had passed, resulting in the evolution of humanity on Earth where the Archaeons had intended to just create a more basic form of life. Still caught up in the Time Lord belief in non-intervention (and evidently completely ignorant of universal history), Stoyn protested that The Doctor's actions had interfered with the Archaeons' experiments, content to let them attempt to undo their work if they would simply grant him access to the TARDIS to return home. Even when he knew that the Archaeons' efforts would destroy life on Earth, Stoyn 'sympathised' with the Archaeons' desire to impose order on the chaos of life, in contrast to The Doctor's ability to recognise that life was messy and deserved to be free. When Stoyn attempted to force The Doctor to link the TARDIS to the Archaeons' equipment so that their base's power could be restored and they could use their weapons against Earth, The Doctor severed the connection, allowing Susan to flee to the TARDIS as Earth fired back against the Archaeons, leaving Stoyn trapped outside the ship. Stoyn stayed on the Moon for some time, but even in the Archaeons' abandoned base, he found that the noise of too many people disrupted his focus. Under unclear circumstances, Stoyn left the Moon and found a planet far away from civilisation that had a semi-sentient evolutionary pattern that would allow it to adapt to what it needed. As a result, the planet provided Stoyn with the means of tracking The Doctor's TARDIS as it travelled through time, as well as allowing him to create a series of wormholes around the planet that would eventually draw the TARDIS to him. Stoyn believed that he calculated precisely where the TARDIS would land when it was finally drawn to his planet, but The Doctor again violated his predictions when the TARDIS materialised in a series of caverns near Stoyn's base rather than in the chamber where Stoyn had expected him to appear. By the time the Second Doctor arrived on the planet, Stoyn's base had become a vast refuge site for those who travelled through the wormholes, but although Stoyn considered himself as having imposed order on this world, he still felt that it was too messy for him. Having come to regard the society of the Time Lords as a world of gods, Stoyn considered The Doctor as a blasphemer who had abandoned the law, but soon found that he was unable to actually enter the TARDIS as The Doctor had specifically programmed the ship to reject any of Stoyn's attempts to enter it even when he had the key. Still rejecting the wider universe as too messy for him, Stoyn 'requested' that The Doctor instruct Jamie and Zoe to assist him in taking components from the TARDIS so that he could use them to transmit a signal back to Gallifrey. Despite being regarded as a good man who had brought peace to this planet, Stoyn was unconcerned that his equipment was accelerating the disruption caused by the wormholes and thus pushing his base to the brink of destruction, even after The Doctor revealed that he had removed a vital piece from one of Stoyn's stolen components so that the power increase would be too great for Stoyn's plan to safely succeed. Thanks to The Doctor's sabotage, Stoyn was drawn into a small wormhole and sent to a random location in time and space, with The Doctor not certain if Stoyn would even survive this turn of events. As The Doctor later discovered, the explosion actually sent Stoyn back along his own lifetime, resulting in him arriving on the Moon, at a point when Earth had been abandoned by humanity due to solar flares ("The Ark" and "The Ark in Space") while the Moon had become a vast theme park of various periods of Earth's history. Using a transducer circuit from the TARDIS and the equipment in the park, Stoyn was able to create a trans-temporal viewer, but he was only ever able to see where The Doctor had gone, leaving him increasingly bitter and outraged at what he perceived as The Doctor corrupting Time Lord society. After being trapped on the moon for around two thousand years, the Fourth Doctor and Romana- currently in her second incarnation- arrived in a lunar park based on Rome, where they were swiftly captured by the park's robot drones, now under Stoyn's control. Driven even more insane at only being able to watch The Doctor's life, Stoyn proclaimed that he would pass judgement on The Doctor as the Time Lords had failed to do with their pitiful sentence of exile (clearly unconcerned about the potential temporal consequences, as at least one screen on the viewer showed an event from The Doctor's future in the form of the Fifth Doctor's role in starting the Fire of London ("The Visitation")), but was interrupted when Romana shattered his viewer, causing Stoyn to fall through the resulting temporal rift. Arriving on Earth in the Roman era, Stoyn was temporally fractured into six identical versions of himself, the six Stoyns sharing one mind and thus requiring intense concentration to even let one of them speak at first. Initially chased by Roman soldiers, the Stoyns were eventually able to use some of the equipment he/they had on them when they fell through the portal as precious minerals to build up some forms of local currency, eventually becoming the patron of Titus, a local playwright. Using the security provided by Titus, Stoyn was able to develop his equipment, aided by his discovery of a particular power source, but even with all the aid Titus gave him, Stoyn regarded Titus as nothing more than a pet. As time went on, Stoyn was able to regain some mental focus, but concentrating everything into one facet of himself left the others blank. This prompted Stoyn to let his other facets become actors in Titus's play, as they could simply repeat the pre-written lines while the prime Stoyn was granted some degree of focus and clear thought. 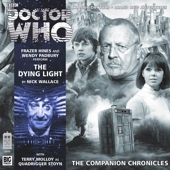 Stoyn eventually found himself with a new chance to escape Earth when earlier versions of the Fourth Doctor and Romana arrived on Earth, Romana still in her first incarnation as she and The Doctor sought the last segment of the Key to Time ("The Ribos Operation" and "The Armageddon Factor"). While The Doctor watched the play 'Luna Romana', written by Titus, Romana believed that she was tracking the sixth segment, but she was actually tracking the primitive transmat system Stoyn had created, realising that it used a segment as its power source. When Stoyn- using the alias of 'Janus'- revealed his former role as a Quadrigger, he was furious upon learning from Romana that his job had since been replaced by a single button in TARDISes post type-54, and there were only a few temporal mechanics left, despite Romana's attempt to placate him that the title was out of use even if his own skills might still be useful. Romana offered to ask The Doctor to take Stoyn back to Gallifrey, at this point unaware of his history with The Doctor, but Stoyn subtly influenced her to help him without asking The Doctor for his input, even convincing her to let him into the TARDIS by claiming that he needed the Zero Room ("Castrovalva") to help him focus his mind while The Doctor's mind was so chaotic that it would destroy Stoyn. Having regained access to the TARDIS, Stoyn led his other selves into the ship before forcing Romana out, triggering a short-range transmat to send Romana up to the temple roof. However, shortly before Stoyn teleported the first Romana away, Romana's second incarnation arrived in the past; after Stoyn had vanished through the collapsing portal, another version of him had appeared in the door of the temple, only to be knocked out by another version of Romana who told her past self to follow Stoyn into the portal. Disguising herself using the actors' masks and robes of the era, the future Romana told The Doctor to leave by posing as her past self, hurrying into the TARDIS while her first self was stuck on the temple roof and The Doctor was occupied with trying to help her. As The Doctor and the first Romana dismantled Stoyn's equipment, they discovered that the power source for the equipment was actually the fifth segment of the Key to Time, despite the fact that they had already retrieved that segment ("The Power of Kroll"), but were unable to get back to the TARDIS before Stoyn departed with it. Stuck underneath the console room, the second Romana watched as the Stoyns set the TARDIS into motion, going back in time to the previous year so that they could bury the fifth segment of the Key in the past and use it as a power source for their equipment. When the Stoyns left the console room, the second Romana reprogrammed the ship to return to Rome after dropping her off in the lunar park, allowing the younger Doctor and her past self to reclaim their ship while Titus took Stoyn's dismantled equipment to fund his future efforts. 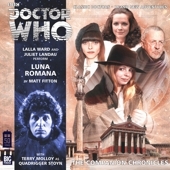 Back on the lunar park, Romana fulfilled her original role of knocking out Stoyn and ordering her younger self to travel back to Rome, leaving her and The Doctor to follow the younger Romana through the portal to Rome after The Doctor adjusted the portal so that it would close after they had left. Arriving back in Rome just after the younger Doctor and Romana had left, The Doctor and Romana were pursued by some of Stoyn's robots as they appeared in front of Titus, but the robots swiftly shut down as they were powered by solar panels on the moon which didn't exist in the past. Although The Doctor had been planning just to wait in the past until a suitable alien invasion occurred so that they could use the invaders' equipment to draw the Time Lords' attention, Stoyn's need for revenge prompted him to return to the past to confront his enemy, The Doctor instructing Titus to simply dismantle the robots for the gold before he and Romana walked into the TARDIS, nonchalant about Stoyn's plans to kill him. Realising what Romana had done when he saw her again in the TARDIS, Stoyn accused her of 'cheating' by crossing her own timeline. 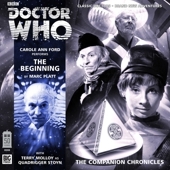 Stoyn countered her claim that she had done the same by claiming that he had simply left the segment on Earth before he arrived rather than after, but Romana felt that Stoyn was flouting the spirit of the Laws of Time even if he was sticking to the letter of the Laws. As Stoyn took them back to the lunar base, he revealed that he had absorbed his other selves back into himself, and had dismantled K9 as he found him annoying. When The Doctor demanded his TARDIS back, Stoyn rejected that idea, proclaiming that the ship was the property of the Capitol and he would take it back as soon as he had 'tided up The Doctor's mess' in the form of his history with Earth. Back on the lunar park, Stoyn had used the park's accumulated solar power from its centuries in action to create a temporal feedback transponder, intending to use the TARDIS to turn his equipment into a temporal destructor that would allow him to turn back the Moon's timeline back by millions of years. This would prevent the Archaeons from seeding Earth from life, thus erasing humanity from existence, Stoyn justifying his actions in the belief that he had the right to pass sentence on The Doctor. When Romana revealed that, back on Gallifrey, a 'Stoyn' was now a term for a mistake in engine repair, such as pressing the wrong switch or leaving a panel open, Stoyn was left further outraged, denouncing The Doctor and Romana as betraying the legacy of Gallifrey. Romana countered by asking what was the point of all their achievements if they never did anything with it, Romana stating that The Doctor had taught her not to ignore a cry for help and she would have abandoned him in Rome if she had just come from the Academy, challenging him to take responsibility for his own actions and accept the need to learn rather than remain blindly focused on his own beliefs. Incapable of accepting anything beyond his need for revenge and his fixation that the universe should be peaceful and serene without messy landings, disgusting atmospheric gases or aliens cluttering up the place. Romana's last sight of Stoyn was of him smiling happily as the sealed console room was enveloped with light, the light fading to reveal that Romana had inverted Stoyn's equipment earlier, with the result that Stoyn was blasted with over three thousand years' worth of accumulated solar energy blasted back at him through a chronon fluctuator and artron amplifier. Romana noted that Stoyn wouldn't have felt a thing, but The Doctor still mourned Stoyn's death, reflecting that he had never intended for Stoyn to end up like this but that he and Romana couldn't help getting involved, no matter what Stoyn believed Gallifrey should be. When the Time War began, a future Romana was involved in decommissioning Stoyn's Quadrigger station on Gallifrey so that the land could be used to build Battle TARDISes. Visiting Stoyn's abandoned station just before it was destroyed, she remembered her past encounters with him, musing that, while Stoyn had refused to learn anything from his time in the universe, The Doctor had taught her so much without meaning to through his loyalty, dedication, and exasperating behaviour.